At the dawn of time, there were 13 Houses in the Zodiac Galaxy. Now only 12 remain.... Rhoma Grace is a 16-year-old student from House Cancer with an unusual way of reading the stars. While her classmates use measurements to make accurate astrological predictions, Rho can�t solve for �x� to save her life�so instead, she looks up at the night sky and makes up stories.When a violent blast strikes the moons of Cancer, sending its ocean planet off-kilter and killing thousands of citizens�including its beloved Guardian�Rho is more surprised than anyone when she is named the House�s new leader. But, a true Cancrian who loves her home fiercely and will protect her people no matter what, Rho accepts.Then, when more Houses fall victim to freak weather catastrophes, Rho starts seeing a pattern in the stars. She suspects Ophiuchus�the exiled 13th Guardian of Zodiac legend�has returned to exact his revenge across the Galaxy. Now Rho�along with Hysan Dax, a young envoy from House Libra, and Mathias, her guide and a member of her Royal Guard�must travel through the Zodiac to warn the other Guardians.But who will believe anything this young novice says? Whom can Rho trust in a universe defined by differences? And how can she convince twelve worlds to unite as one Zodiac?Embark on a dazzling journey with ZODIAC, the first novel in an epic sci-fi-meets-high-fantasy series set in a galaxy inspired by the astrological signs. Hey all! We are beyond thrilled to welcome Romina Russell, debut author of�Zodiac here to Good Books & Good Wine today to answer a few questions. Stay tuned for a giveaway below. 1. 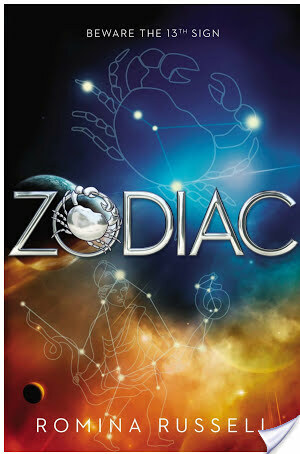 As Zodiac is about a universe inspired by the astrological signs, what is your sign? 2. Do you believe in astrology at all? Why or why not? I write like Mulder but live like Scully: While I think astrology is a lot of fun and involves some fascinating sociological and mythological concepts, I don�t really subscribe to it. I�m too much of a pragmatic Virgo who only trusts what she can touch! 3. Which character was your favorite to write about? I loved writing the romance scenes between Rho and her suitors! I love Victorian novels and have an obsession with forbidden/torturous/complicated romances, so it was awesome getting to orchestrate those moments and explore their ramifications. 4. How did it feel when you got the call that Zodiac had sold? Getting the call was an indescribably amazing feeling�made even better by the fact that it was a friend calling! My editor, Liz Tingue, and I met a decade ago, in a college class, and now the stars have brought us together again for ZODIAC. 5. What book or books are currently on your nightstand? SUSPICION by Alexandra Monir and WINTER FALLS by Nicole Maggi. 6. If you could sum up Zodiac twitter style (150 characters or less) how would you do it? ZODIAC is a Sci Fi series that’s more Fi than Sci, featuring 13 made-up cultures, 11 futuristic technologies, 2 hot guys, and 1 fallible MC. I loved the interview! Chatting with Romania on Twitter has been sucha pleasure can’t wait to rea this book! Great interview! I love the Twitter summary! P.S. Thanks for the chance to win! Ah, I love that Romina writes about the Zodiac stuff but doesn’t really buy into it herself. I agree, while I find it fun and fascinating, I don’t put any stock in it. Either way, this book sounds incredibly unique and fun, and I can’t wait to read it! Thanks for the chance! Shannon recently posted..Have a Spiffy, Gif-y Christmas!